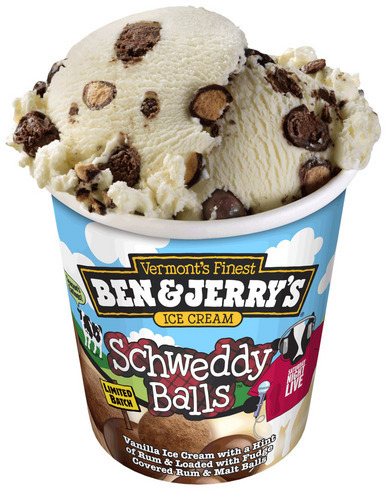 At long last, Ben & Jerry’s is making Schweddy Balls available by the pint in ice cream form. A clever nod to the popular Saturday Night Live sketch starring Ana Gasteyer, Molly Shannon and special guest Alec Baldwin, the ingredients of B&J’s new ice cream flavor actually sound pretty tasty. Ben & Jerry made the announcement and NPR posted a photo of the pint (below). A pint of Schweddy Balls offers “vanilla ice cream with a hint of rum & loaded wih fudge, covered rum & malt balls.” As shown in the image below, this is a “Limited Batch,” so you’ll probably want to get a pint while you can. In the meantime, below is the sketch on which this special flavor is based. Now we just have to wait and see if they’re going to make a pint of ice cream inspired by Betty White’s dusty muffin.